Apple touted quite a few new iPhone features at yesterday's OS 3.0 event, but now that the beta build is trickling out, there's been a bevy of unearthed discoveries to further pique our interests. 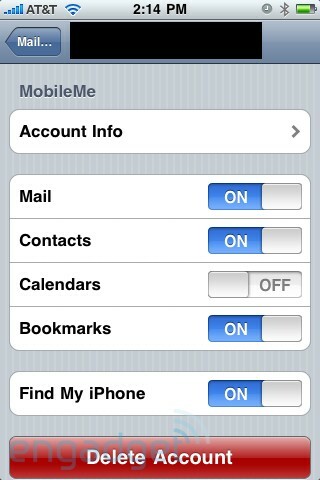 First up, the gang at Boy Genius Report found an option to enable the "Find My iPhone" service in the MobileMe settings. Unfortunately, that's all we've got, but we wouldn't put it past Cupertino to build some me.com-linked location tracker that'd be the envy of Orwell himself -- hey, that'd be pretty useful if you accidentally left the mobile in a taxi. Also in the MobileMe section, it now says Publish Video when you go to publish an image. It's an odd typo, to be sure, and while video recording has been near the top of our wishlist for some time, we're not about to get our hopes up. Finally, Mac Rumors is reporting that a hacker has dug up and successfully activated the USB tethering capabilities. Apple's Scott Forstall had mentioned the devs were building it in, but were still in talks with the carriers. As to whether any or all of these functions will actually end up in the final OS 3.0 build, your guess is a good as ours. 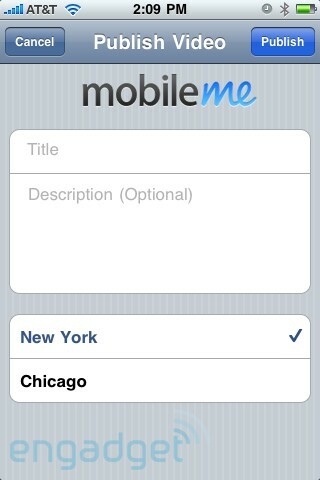 For now, check out more pics of the MobileMe additions after the break.